SMBs from all over the world, most of our clients are software companies, advertising agencies, retailers, distributers etc. Reduce manual work for Purchasing Manager, Procurement and Financial Departments with an easy-to-use Spend Management solution designed to help companies control their spendings and generate savings. Streamline the Approving Process, generate Purchase Orders and manage Purchase Requests easily with Precoro. Pros: Our employees really like simple and pretty catalog of goods and services that they can request. Analytics helps me to report CFO about our spendings any time. 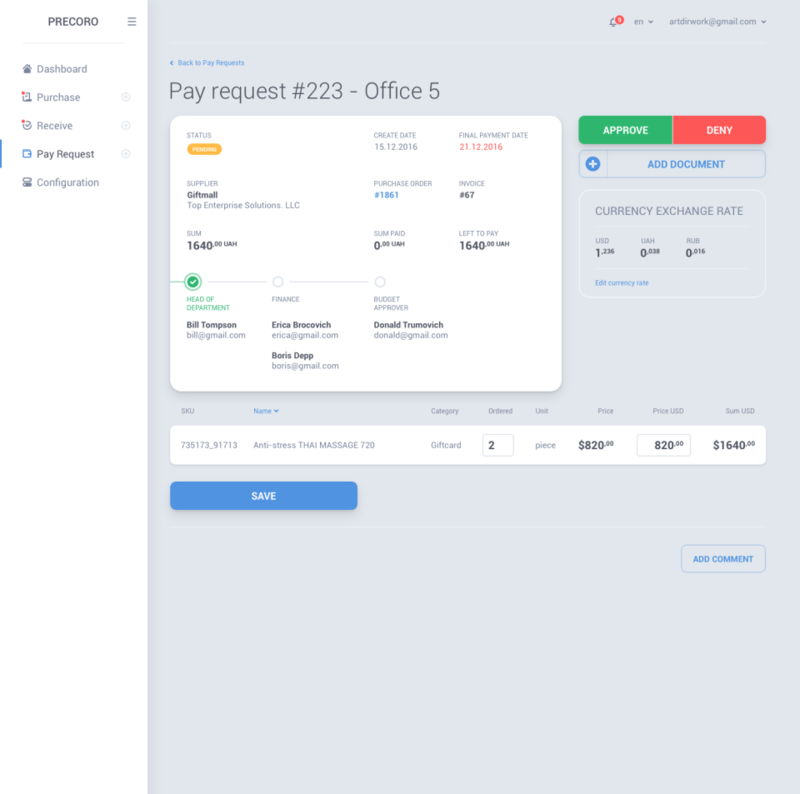 I think, that the time I spend from making a request to buy and pay bills has decreased and there's a bit less chaos in making purchase request - now they use only Precoro, instead of email, paper, phone etc. Overall: We use Precoro in our 4 offices to analyse all the spendings around the company. 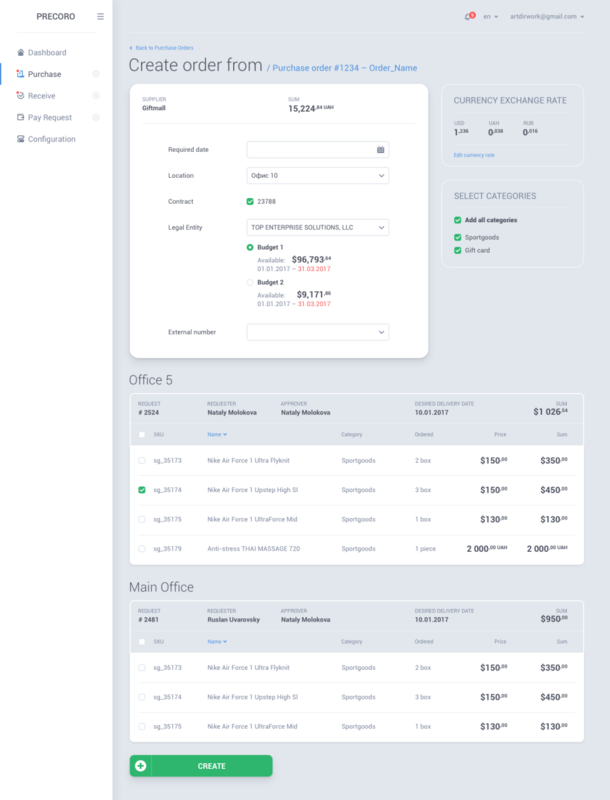 Precoro helps us to track all the spendings, beginning with office purchases and ending with Internet connection. Each employee has his own Precoro account and they make purchase requests, that I approve and send to suppliers directly from Precoro. The most useful feature for me as the responsible purchaser is great spend analytics and reports. Cons: We're waiting for the integration with our warehouse tool to automate all process. Overall: We have 28 regions representatives and 19 office employees working in Precoro. All the representatives sell tires and autobatteries. When they need any of this, they use catalog of Shypshyna's products to request them from warehouse (office employees). There is approval routing of 3 employees. Pros: 1. Easy use. 2. Quick order of goods and services. 3. Client support. 4. Opportunity to compare prices from different suppliers. 5. Budget control. 6. Reporting on the orders. Overall: We use this software for order office materials and other services daily and have a lot of advantages. The most important is that we can control the orders of our employees and limit the budget. Recommendations to other buyers: Sometimes hardly to find appropriate supplier, it would be great if you could help in such search. Thank you so much! We really appreciate your review! Overall: We use Precoro every day to create POs and send them directly to suppliers. The best feature for us is allocation of purchases on cost centers. I really like friendly interface, the product is easy to setup and configure. Also we integrated Precoro with our ERP SAP and Microsoft Dynamics to get all spending data in one place. Overall: Our small business besided to try some new software and we are completely satisfied with this new and easy product. It is easier to use for any unexperienced user and works nimble. Thanks to Precoro clouds it became more handy to connect data with our branches and partners. I've been using Precoro for several months. The software meets my expectations - improves my work. Pros: Precoro is great. For me, the best thing is that this software is easy to use, reduces working time and helps me do time-consuming tasks. Cons: As a software user - I have no objections. As an employee of the purchasing department - the solution could cost less. Overall: With Precoro, I save time. This software streamlines my work. In the past, I devoted more time to tasks that I now realize faster. We're glad to know that Precoro helps you to improve your process! Overall: Very easy to make repeatable purchases and create customizable reports, that we import to SAP. Also we use contract management with prepayment suppliers. Overall: Before work prosses in my company looked like a chaos. There were a lot unrecorded expenses, backlogs and so on. But soft ware Precoro gave me decision of all my problems. Now my bussines is just please beause and click on the one buttom and see all nessesary information on my sreen. Moreover due to Precoro I have a lot of free time now. Pros: I use Precoro with my two subordinates. Functionality feeds all our needs. Remote access possibility is handy, I always go to business trips and can approve all in my smartphone. Cons: It was complicated a bit to move from habitual Excel, but we've done it with customer support manager. Overall: Time savings, remote access, visibility of company's spending. Overall: The main reason why I use Precoro is to combine all the suppliers' catalogs in one. Precoro professionally does the following job. In addition, it is relatively cheap and very easy in use. Buy it try it. Overall: I make all the office supplies purchasing throw Precoro about two years, it's pretty easy to setup and use. 4. User level access and configuration is simply superb, for sure you will not get this feature with this amount. Cons: 1. PR/PO approval should be more configurable, currently it is based on the price, should also be based on the type, dimension of the product as well. 2. Budgeting should also be possible to the location level. Overall: Overall, it is very nice and handy tool. Kapil, thank you very much for the review! Our budgeting module does work on the location level in fact. Our Customer Success Team will help you to set up the budgets according to your company's needs! Comments: Our favorite feature is getting reports with auto allocated cost-centers and import them in our ERP, because it saves a lot of time for us. It would be great if we could integrate it with our warehouse. Thanks for your response, Marina! Overall: This software has been used for several months. The software interface is very comfortable to use and well thought out by developers Controlling expenditures has become much more easier. Such operations take up a minimum amount of time. Most of the paperwork turned into electronic form. The program has a good function of comparing prices from different suppliers. This skill simplifies the ordering process. Many thanks to customer support. Precoro team respond to all questions very quickly. 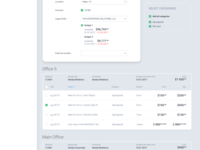 Overall: Comfortable and easy to use tool to purchase all the office stuff, manage rent spendings and review analytics by period. Overall: It was enough easy and quickly to setup. Our most valuable functions are approval workflow and vendor consolidation, cause now I work with vendors form only one resource and I don't use excel or skype to manage requests. Overall: Acquiring Precoro is probably the best decision I have done to my business, starting from its emergence. The fact that I can use it with any internet-connected device makes Precoro indispensable product. Being a small-business owner, is easily can log onto the software from any place with Internet access and hence be in constant touch with the latest data available in my company's storage. Overall: So easy and intuitive to use! Thank You for developing such a unique product. My small business fully abandoned C1 after purchasing Precoro. I have an online and offline shops and it works perfectly at both for me. Be sure that I reccomend it to my partners and customers. Comments: Precoro assists and provides the tool necessary to order/purchase items. Otherwise we would have to use credit. It helps in having a system of locating and keeps an account on specific purchases. Comments: I am grateful for the privilege to leave a review about this amazing companyt! They invented really good product for a different companies. I am a director of small company, however over 70 people are at my disposal. As you probably know, the ordering prosecc of nessasery things for each employee really takes too much time. And, I think, the best benefit of their program is that you can save the time which is being spent on this prosecc. I really think so, because the time is the most important thing that we have. Of course, I also recommend you to be a customer of this company. Pros: Customer service and flexibility to adapt to our current operations. Overall: It has helped us to gather all the purchase info in one place, king the process more transparent and accurate. Comments: As a head physician, I try to find out best ways to optimize work-time of the hospital. When my assistant came and told about Precoro and how it can help as to make purchase contract I was very distrust. But now after only 3 month I can't imagine our work without this service. Comments: I've been using Precoro for two years now and I can honestly say that they have the best service available for my small business. I used to use Excel and I will never go back. Thanks Precoro, I have more time on generating new ideas for my growing business. Comments: I am happy to have the opportunity to use the service Precoro. This service is convenient. Service a modern and easy to install and configure. Beautiful user interface. With service Precoro monitor and analyze the costs of the company is very convenient. Our costs are significantly reduced due Precoro. I plan to install the service Precoro and in the branch of my company. Overall: I started using Precoro on the recommendation of my friend who is running a mid-sized business. Frankly speaking, I am very grateful to him for the advice, because now my small business is finally brings profit. I am especially pleased with its friendly-user interface and convenient price. Comments: My employees persuaded me to acquire Precoro 2 years ago. 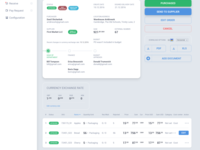 At first it was unusual to see how simple SaaS copes with a whole bunch of difficult tasks that sometimes are beyond the power of skillful employees. With time I get used to smart Precoro application and now can't imagine my company's life without it. Comments: I've been using Precoro software for three months and absolutely love it. The best thing about the following SaaS is its affordability and usability. For me, Precoro is the convenient service that allows my small business to grow and develop in the right direction without any obstacles. Comments: Very interesting soft for accounting. It's really easy and more comfortable to use than 1C or other accounting applications. The greatest advantage of Precoro is cloud mechanism and opportunities for cooperative work. Electronic tables' function is more accessible than Microsoft Excel Tables. Overall: Precoro is extremely easy to use. 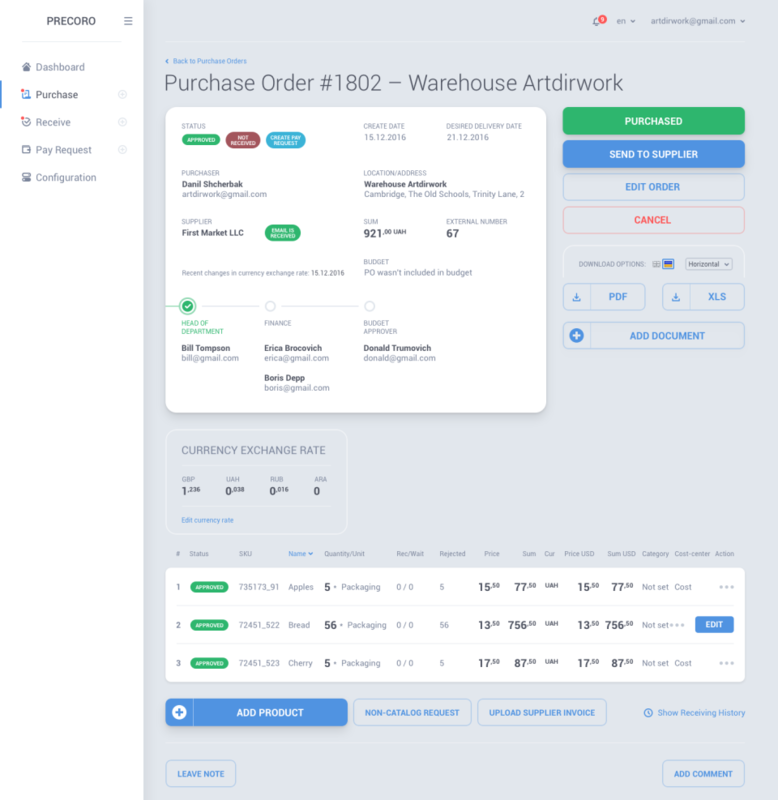 I enjoy this application because it perfectly helps me to generate purchase orders and create purchase requests without much effort. My team uses it on a daily basis and there are still no problems with it. Comments: As a school accounter I always had to work with a horrible amount of papers. But with Precoro my job became so easy! I have not to wait for the statistics, it's automatically saved by the program. I really like this software and recommend it to everyone. Cons: for my company it would be better if Precoro was a local-machine software. Don't like to depend on the Internet. Overall: Precoro makes it easy for my team to get approvals for the supplies that we need in short terms. Comments: The implementation of Precoro software was smooth and the support continues to be great! It has made our organization's purchasing process so much easier. Precoro empowers me with the ability to add more strategic value to my company. Comments: Once I started my own business I needed software for paying bills and controlling spending. While searching I stopped on Precoro. For me it's the best SaaS to unlock value across existing financial operations and business networks. 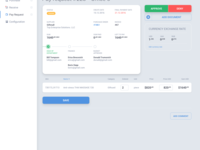 Comments: Our employees create Purchase Requests and generate POs throw Precoro. They reduce time on making requests with catalog. I, as their manager, get comprehensive control on what is going on in our business. New experience in controlling my spendings. Overall: Before meeting with Precoro, I always a self-controlled process of my company purchases. It takes a lot of time and I'm tired... The company has simplified me all these things. Now, instead of me, their software does all the works such as control spendings, work with Excel and 1C. I really recommend this company! :) I am happy to work with them. Comments: Most softwares I searched were not so simple and clear to use as Precoro. I use it to achieve transparency in purchasing and control all the spendings in our company. Comments: The main reason I like Precoro is that it allows my company to scale as fast and as much as needed without replacing costly infrastructure or adding staff. Comments: I found Precoro software great at integrating my warehouse. Moreover, updates are frequently. Therefore, I prefer.